When I started learning Microsoft Access in 1996 the first challenge that I have faced was how to find a particular record on the Data Editing Screen or Filter a group of records on some condition. I was asked to develop a System for the Vehicles Division of our Company, for tracking pending Orders and Receipts of Heavy Equipments and Vehicles. If I am the one who is going to use the System, then some how I could manage to find the information that I want to work with and nobody will know how much time I spent for doing that. But it is going to be used by someone else and it is my job to make it as user friendly as possible. Even though I have good knowledge of BASIC Language at that time, knew nothing about Access Basic (MS-Access Ver.2 language, a primitive form of Visual Basic). I struggled with the problem for a while and finally decided to have a look in the Northwind.mdb sample database for clues. There it was, on the Customer Phone List Form, the technique that I was struggling for so long. Within an Option Group Control, 27 Buttons with Labels A-Z, All to filter Records of Company Name starting with the respective letter on the Button or to remove the filter using the All labeled button. The Option Group is linked to a Macro (Customer Phone List) for testing, which button on the option group is clicked, and to filter the Company Names starting with that letter. There were no second thoughts on this and I straight away transplanted this method on my first MS-Access Project. It was developed without touching a single line of Access Basic Code, all automated procedures are run with macros and this is still in use. We will look into the Finding or Filtering records using three different methods on the same Form. You can use any one of the three methods or all of them in your Project. We will use the Products Table from the Northwind.mdb sample Database. Import the Products Table from the Northwind.mdb Database. Visit the Page Saving Data on forms not in Table to find the location reference of the Northwind.mdb database, if you are not sure where to find it. Click on the Table and select Form from Insert menu and select Autoform: Columnar from the displayed list, click OK to create the Form and save it with the suggested name: Products. Display the Form Header/Footer Sections, if not already visible. Select Form Header/Footer from View Menu. Create a Label on the Header Section of the Form and type Products List as Caption. Click on the Label and change the character size to 20 or more, to your liking, and make it Bold using the Format Toolbar above. NB: If you would like to create the same 3D Style Heading, visit the Page: Shadow 3D Heading Style and follow the procedure explained there. Click on the first button, Display the Property Sheet and change the property Values. Click on the second button, Display the Property Sheet and change the property Values. Click on the third Button, Display the Property Sheet and change the property Values. Click on the fourth Button, Display the Property Sheet and change the property Values. Display the Visual Basic Module of the form, select Tools . . . > Macros . . . > Visual Basic Editor when the Products Form is still in Design View. MsgBox "Give Product ID Number..!" 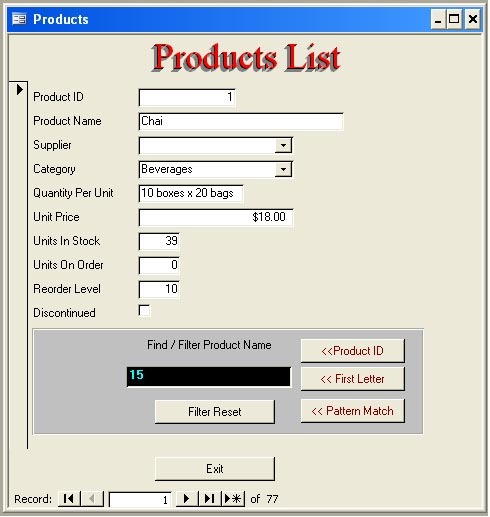 Me.Filter = "Products.ProductName Like '" & xfirstletter & "*'"
Me.Filter = "Products.ProductName Like '*" & xpatternmatch & "*'"
Usage of << Product ID Button. Click the Button with a Number less than or equal to the Product Code range of values in the Text Box. If clicked with Text Value it will ask for Product ID Number. If clicked when the Text Box is empty, it is same as clicking Filter Reset Button. Usage of << First Letter Button. Click the Button with any Alphabet A to Z or a to z in the Text Box. If more than one character is entered only the first character will be taken. If Numeric Value is entered the filter action will be ignored. If clicked when the Text Box is empty, it is same as clicking the Filter Reset Button. Usage of << Pattern Match Button. Click the Button with group of characters that to match anywhere within the Product Name. Usage of Filter Reset Button. Resets the earlier applied Filter action. Empties the Text Box Control. The Example and Code is fully tested. Be specific on your issues perhaps I could help to sort it out. If you need a demo version of the example give your e-mail address. I'm trying to adapt this code to an excel form. the Debugger says me.filter.on is not defined. I am only using the pattern match button. Is there a difference in the tags in excel? Any idea what I need to do to define me.filter? I can send a sample file if that would help. Forward a copy of the Excel file to aprpillai@msaccesstips.com. When I debug the system is warning me about missing operator. but the above statement will not generate any error. rst.FindFirst “CodProdus = '” & m_find & "'"